Is it beneficial to be an early AI adopter? Many organizations have not yet started using Artificial Intelligence (AI) to tackle the large amounts of unstructured data that they see on any given day, with some saying that the technology is too untested and poses too much of a risk. Ari Juntunen, CTO at Elinar Oy Ltd., an Enterprise Content Management solution provider, disagrees. She believes AI holds the key to automating business processes such as sales orders, invoices, and even GDPR discovery. 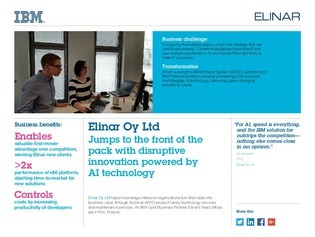 Read this case study to see what benefits Elinar Oy has seen from using AI, and what being an early adopter could mean for you in your industry.